A small room appartment with cooking area and bathroom with shower. right next to it is our wonderful pool and barbecue. Podere Consalvo is a typical Tuscan country house. Surrounded by the rolling hills of Chianti Classico, which is about 4 hectares of land the Consalvo family is with her characteristic guest house in the Tuscan countryside. It is just a whole 15 km from Florence. Thanks to the happy position (265 m above the sea level) it know on a very pleasant climate and opens generously to the surrounding vineyards and olive groves out. It offers our guests a beautiful and unspoilt countryside, the requirement to offer our guests a comfortable and relaxing holiday. It is produced organic olive oil. A spacious garden with olive and fruit trees and a vegetable garden are at guests' disposal. A panoramic view to Florence with the Cathedral dome is at your feet. The property is surrounded by a hedge and has a large covered parking. The new swimming pool also offers on hot days the desired refreshment. Countryside: You have the option to pick their vegetables from the garden according to the season. In addition, according to request the owner will offer an afternoon program where they show you San Casciano with his sight. More offers depending on the season, will be waiting for you. Depending on your interests provides the possession clean 'cooking together' and invites you to the cold-pressed organic olive oil and fresh vegetables from the garden to get a taste of Tuscan cuisine. Homemade Tagliatelle with free shear tomato sauce is always on the Programmm. We look forward to welcome you as an individual guest We have max. 6 guests and can give us time for the individual wishes of our guests. Culture and relax are garantee and you will receive the most necessary information from us that you will discover Florence and the chianti shire not as a tourist but as a local habitant. From a purely logistical perspective, our domicile is very favorable. Only half an hour from Florence. You have the possibility to take the bus to Florence. On foot you can discover our small town of San Casciano --- 1.5 km, so you can stop for a sip of wine through the vineyards in the evening. 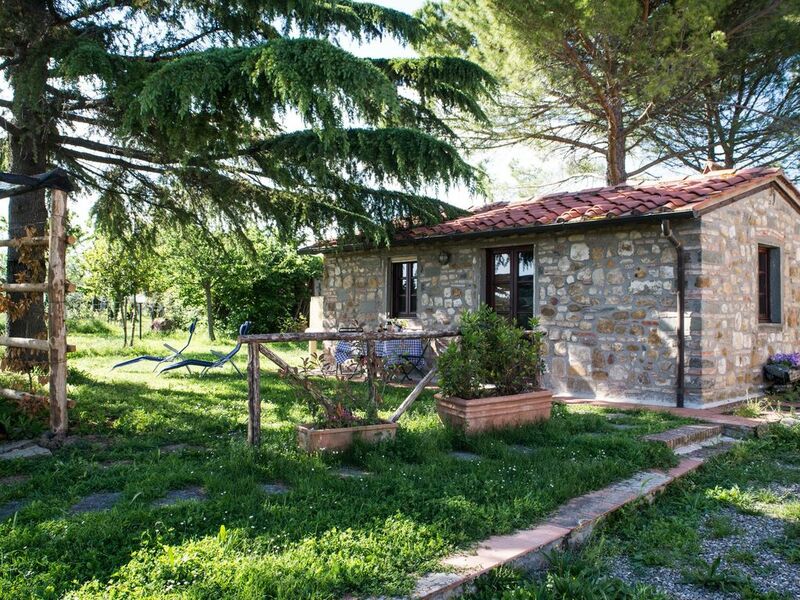 It’s a very nice farm near San Casciano and 20 minutes from Florence. Elisabeth is a fantastic Host and we really enjoyed our stay! Un accueil chaleureux, Elisabeth est très attentive et de bon conseils pour visiter la région. La location est petite, parfaite pour les vacances. Venez nombreux découvrir la Toscane. Wir wohnten eine Woche in dieser kleinen Ferienwohnung in einem sehr ruhigen Grundstück. Die Wohnung ist einfach, aber sehr praktisch eingerichtet. Sehr angenehm war ein größerer Pool unmittelbar neben der Wohnung und die wertvollen Tipps der Vermieterin. Ein vorzüglicher Ausgangspunkt für Ausflüge nach Florenz und die weitere und nähere Umgebung in der Toskana. Ein wunderschöner Urlaub! Schöne Unterkunft und eine sehr nette Gastgeber Familie. Kann man nur empfehlen! Jederzeit wieder! Eine traumhaft schöne Urlaubswoche im Chianti Gebiet liegt hinter uns. Wir fühlten uns rundum wohl im Podere Consalvo. Das kleine Häuschen war gar nicht soo klein, es ist alles da was man braucht. Besonders schön war der Pool direkt neben dem Haus den wir wegen der sehr hohen Temperaturen auch häufig nutzten. Von unserer Gastgeberin kamen tolle Tipps bezüglich Veranstaltungen, Restaurants und Ausflugszielen und vieles mehr. Die Lage war ideal für Ausflüge. Zum Frühstück gab es leckere Tomaten aus dem Garten und auch mal ein Frühstücksei frisch aus dem Hühnerstall. Das gemütliche, kleine Monolokal ist einfach ausgestattet, hat jedoch alles was man braucht. Das kleine Häuschen ist wunderbar direkt am Pool gelegen und bietet die ideale Umgebung zum Erholen. Frisches Gemüse & Kräuter vom Garten konnten wir gratis beziehen. Die Vermieter sind sehr freundlich und hilfsbereit. Wir können einen Aufenthalt wärmstens weiter empfehlen! Our farm is surrounded by Tuscan hills between Florence and Siena in the Chianti region. Thanks to the happy position (265 m above the sea level) it takes great advantage of the pleasant climate and a wonderful overview of the surrounding vineyards and olive groves. After San Casciano (15,000 inhabitants) is a typical Italian town is our Podere 1 km away. There you will find great shopping and unique inns and trattorias. A wonderful view of Florence as vineyards and olive groves. Public transport connections to Florence Siena are offered. Privacy is our first priority, so you can relax in peace and quiet. Elisabeth Consalvo, the owner will be delighted to learn about hiking excursions such as culture, as well as weekly markets. Cooking classes like painting courses can be organized. On request, we go shopping for you, so you have everything on your arrival.